It's been ages since we've talked about hair. To be honest, I'm fairly stuck in my ways when it comes to the products and methods I use, and even more glacial when it comes to changing my style. Just before having Theo I got my hair cut into a lob, which was the biggest change I'd made to my hair in years. I really liked the style but I've let it grow since so it's just below my shoulders now. This length is easy to style and easy to deal with. As I'm not very creative or very patient when it comes to styling, this suits me fine! There are some products Ive found that give me the finish I want and work well together, so I'm going to share those here- and one new thing I tried that turned out to be just awful as well! So I'd never heard of this range before until I found it hidden away in Boots last month. I say hidden because it was actually in the pharmacy section of the shop, with all the hair loss treatments rather than with the regular hair products. I'm all about the high hair to heaven (Barbarella and Britt Eckland are my hair icons, and on my wedding day I gave the stylist a picture of Priscilla Presley when she married Elvis), so of course the promise of thick, volumised locks always draws me in. And this little beauty really delivers! You spray it all over wet hair, and the heat from your hairdryer activates thickening proteins in the formula that bind to the follicles, it adds volume for days and texture to boot. It's just magic! The formula contains hair-building keratin, lifting polymers, sea salt, caffeine and smoothing niacinamide to care for your scalp. Peptides help to repair the cuticle, and proteins protect against heat damage. This spray literally has it all. I love it when I find something like this that really delivers. This is going to be a repeat purchase for me from now on. This stuff is amazing for getting that breezy, undone Instagram-hair texture that looks so casual but is devilishly hard to achieve without looking a mess. 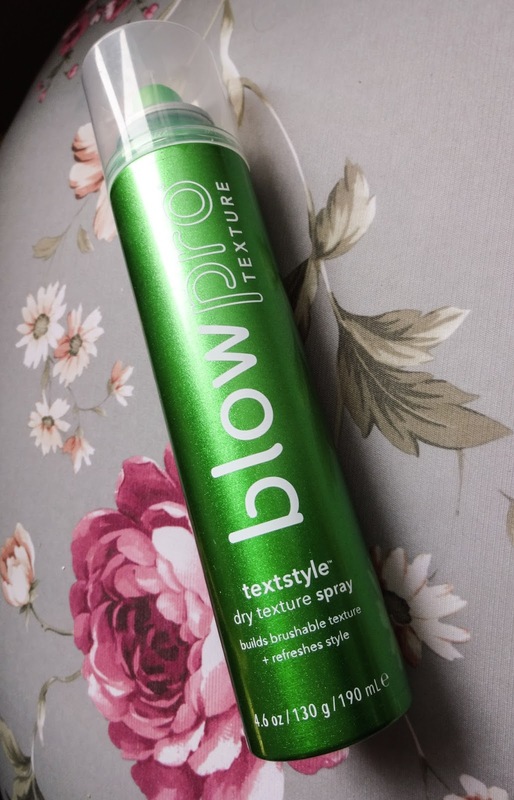 I like to create waves using my GHD’s, and then spray them with this and ruffle through with my fingers, which gives them that artfully windswept look. 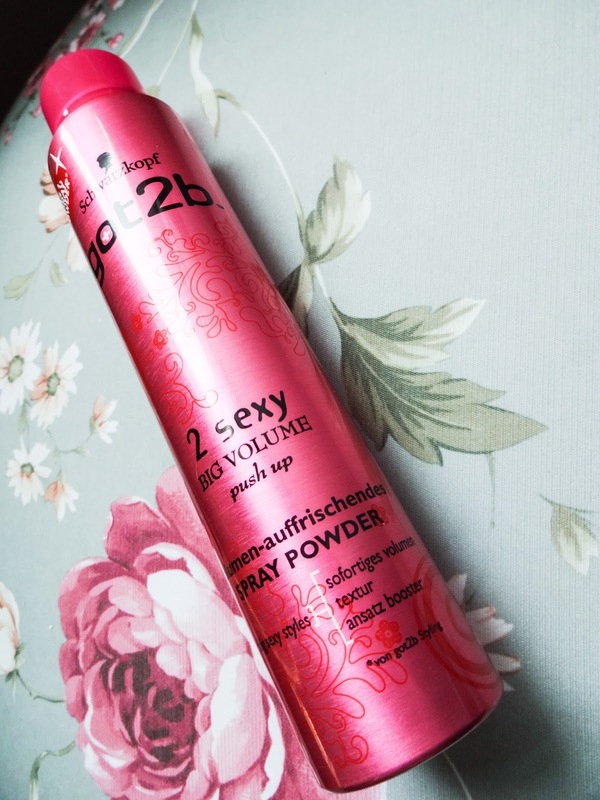 It also works fantastically for creating ‘grip’ for up do’s or pony tails, especially on freshly washed, slippy locks. This is such a nice texture as its a dry spray so it doesn't feel greasy or sticky at all. It also leaves a soft finish, unlike a lot of texture sprays that go repulsively crispy. It has truffle extract, basil flower and rooibois leaf extract with starch that mops up any oil and creates a really nice, flexible hold. 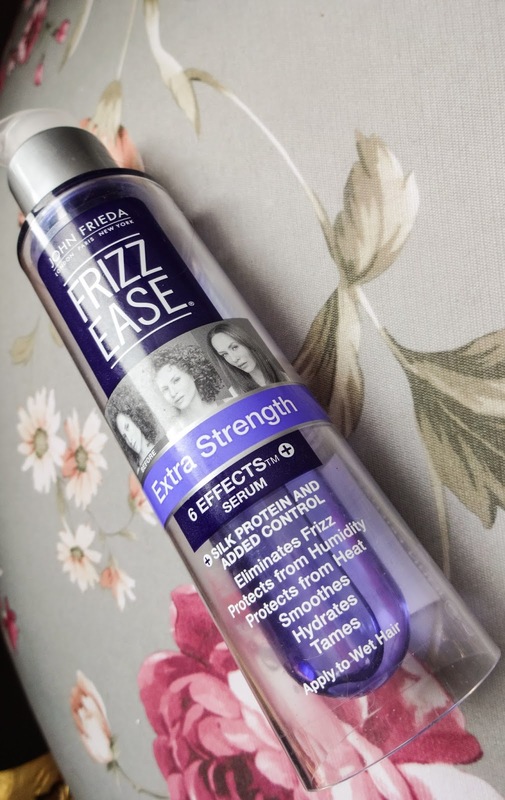 Frizz Ease serum has been around for so long now, and it's one of those things I rediscover from time to time and then wonder why I ever let it go! When it first launched, when I was about 12 or so, it was the only thing that would tame my hair and I was obsessed with it. A few years back, I got into the version that came in an orange tube and was a heat protectant. And now the classic serum has been reformulated again, and it's even more badass. I'm addicted to how silky and shiny it makes my locks (this is a big deal when you live in a hard water area). The thermal protection is still there and now there are silk proteins and algae extract to boot. This stuff really does give me the hair I want. I can really feel a difference when I don't use it and it's key for getting that beautiful, swishy feeling. I have a very love/hate relationship with traditional dry shampoo. As a lazy person who hates washing my hair, I like the idea of it, but the results are usually lacking. Either it leaves a weird sticky feeling that makes me want to wet wash immediately, or it leaves a white residue on my dark hair. Or it doesn't really feel like it's done anything at all. So I swing between using tonnes of it or none at all. This product (which is labelled as a ‘spray powder) is far better for me. There's no heavy feeling, it gives tonnes of volume at the roots and mops up any oil and even though it's not tinted, I don't get weird white patches with it. Plus, it smells like raspberry sherbet, which can only be A Very Good Thing. 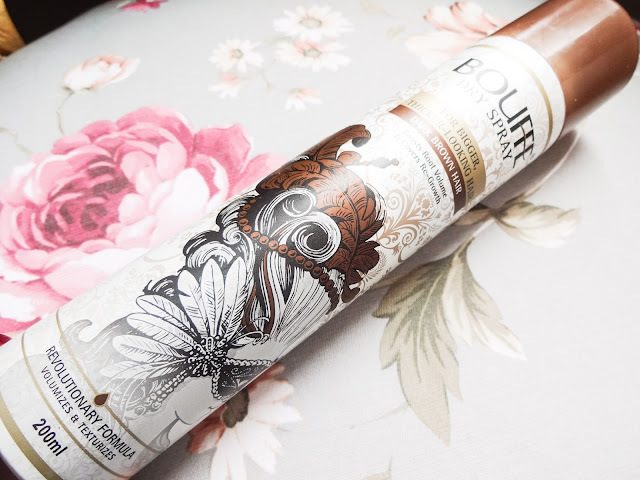 I like to use this on my in between washing days to re-plump and freshen my hair, and it's a lovely fresh sensation that doesn't seem to leave lots of residue behind. Best of all, this is really purse-friendly and gives you that extra height in your hair and spring in your step. On to my one to avoid. I hunted this down at several places before I finally got my hands on a can, and I wish I hadn't bothered! 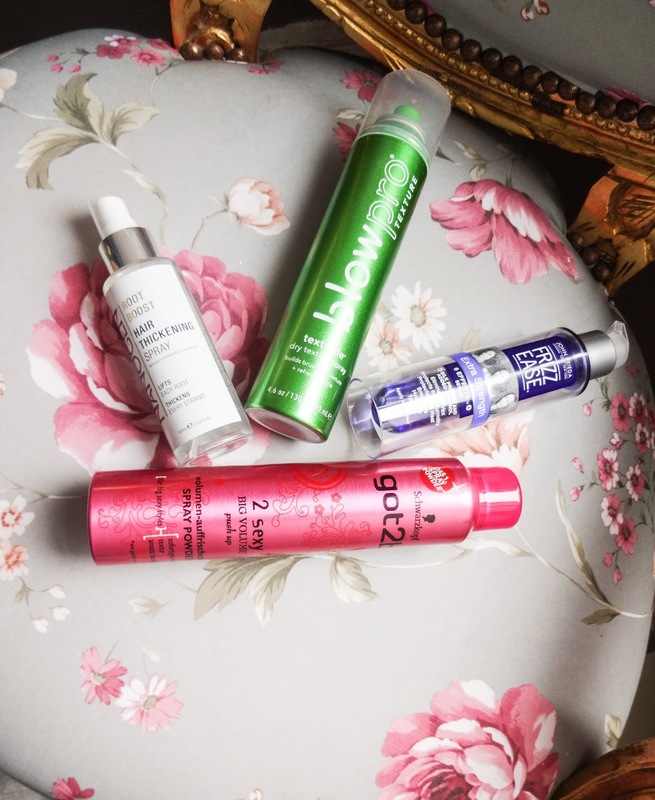 As I said above, I love the idea of dry shampoo but the results are often patchy for me, and yet I feel like it's a product I need in my life. I thought Bouffe might be the one. For a start, the can is achingly pretty, which sucked me in. I love the line drawing illustrations on the front. It claims that its a ‘revolutionary formula’ that lifts roots, gives the effect of a salon blow dry and disguises root re growth (not an issue for me as I don't colour my hair at the moment but still a bonus). There's a range of colour options, plus a ‘fixing spray’ that seals the effect in. With hindsight, that seems off. I mean, if this ‘revolutionary’ product truly works so well, why do I need to purchase a separate spray to make it last? Surely it should just do its job? This product left my hair feeling like it was coated with a thick, sticky residue. It felt disgusting and I honestly wanted to go and wash it out as soon as I'd sprayed it in. I couldn't touch my hair without cringing! The colour is also an issue. It's almost visible on the hair, like you've spray painted your roots. And It. Gets. Everywhere. My white bathroom tiles, my forehead and my hands were left coated in brown sludge. Not the best look. I only realised when I pulled on my top and the neckline got covered in it as well. You are directed to ‘massage’ it in with your fingers but if you’re using the darker shades that is a complete disaster. It did have a slightly volumising effect but honestly, I was so busy shuddering about how my hair felt and feeling cross about all the mess I had to clean up, I didn't even notice. Very rarely do I ever want to sling something straight in the bin, I always try and make things work if I've paid for them, but this stuff is beyond the effort. Now, hair and makeup products are very personal and I see that this has had some glowing reviews elsewhere but I can't figure out why. There are products that do a much better job out there! This is just a tinted dry shampoo that leaves my hair a sticky mess and my bathroom a disaster zone. So those are my current hair favourites. What are you loving right now? 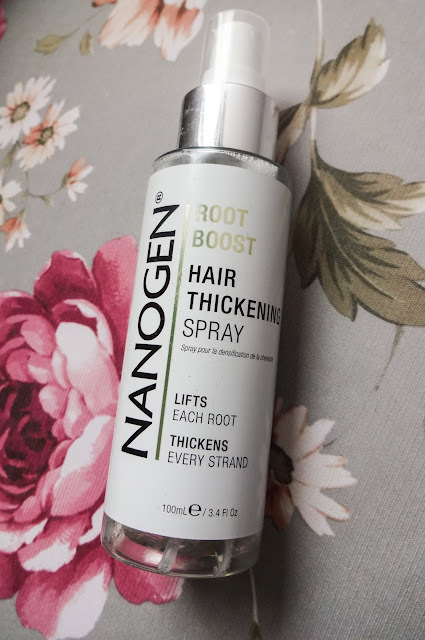 My hair has been absolutely RUINED by bleach over the years and now it feels so thin and rubbbiiissssh, so I will definitely be trying out that Nanogen thickening spray!